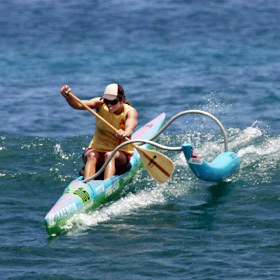 ISLAND IMAGES » Lauren Bartlett, the first female finisher of the Starbucks Kaiwi Canoe Relay yesterday, surfed a wave off Magic Island after crossing the finish line. » Moanalua's Merkle captures Jennie K.
Last-minute lobbying by activists keeps the door closed on large corporate donations. The teachers union gives its president a second and final three-year term. Hawaii-based forensic scientists turn experience to prose that illuminates the forbidding but fascinating world of blood and bones. Julio Concepcion's daily deliveries keep vehicles on Oahu from running on empty. Hawaii's schools have gotten a big share of the state's revenue surplus.